When Care Coordinator Terry Deeds, RN (right), first met Danny Christy (left), his patient weighed just 91 pounds and had a diabetic sore on his head that was so bad, you could see part of his skull. Danny is 51 and has diabetes and schizophrenia. 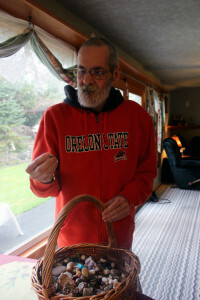 He had been living with family, but his health had declined rapidly after he was diagnosed with diabetes 3 years before. Danny would eat a month’s worth of food in a week. But it would only increase his blood sugar because he wasn’t taking his medication and he wasn’t eating the right food. Danny’s blood sugar skyrocketed to four times the normal target range. After being taken to the hospital three times for dehydration due to kidney failure, a complication of uncontrolled diabetes, Danny was referred to East Linn Health Center, one of four primary care clinics that make up the Community Health Centers of Benton and Linn Counties. Danny was assigned to a primary care provider, Theo Orchard, PA-C. Danny’s uncontrolled diabetes was the biggest concern, because it can lead to major health complications, such as heart attacks, stroke, eye disease, kidney disease, nerve disease and infection. Orchard sent Danny to meet with Deeds, who is a certified diabetic educator. Deeds and other nurse care coordinators help patients manage their conditions and navigate the complex health care system. 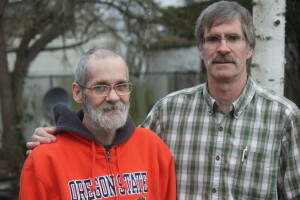 Deeds knew that Danny needed a new place to live where he could get help with his medications and eat a healthy diet. He helped arrange for Danny to move to a nursing home to recover, then he called the office for Senior & Disability Services in Albany to see if Danny would qualify to live in a group home. An initial evaluation determined Danny didn’t qualify. But Deeds followed up and questioned the results, asking for a re-evaluation. The second time, Danny met the criteria and was able to move to Maple Inn Family Care in Lebanon. A year later, Danny has regained his strength and is thriving. The Community Health Centers has put a focus on ensuring that all patients gets the care they need. Every day, dozens of people call the clinics with medical issues, such as questions about medications, complications or worries about children. The nurse care coordinators are a resource for answering these questions and getting referrals to the appropriate care. “When people are sick, they don’t always know where to start,” Deeds said. Care coordinators also track patients to ensure that they are able to follow a care plan. Deeds teaches diabetic patients about making changes in their diet. He said patients with a chronic condition can learn to manage it and lead a longer, happier life. “Being healthy is 95 percent about taking care of yourself,” Deeds said.